In today’s times this quote of George Orwell makes utmost sense when being related to Islam, Left, Neo-Liberalism and their respective champions. If you are on the Right or even Centre-Right side of the political spectrum you can relate this quote with positions taken by these champions I mentioned above. Apologias given by Leftists in defence of Militant Islam deceives Neo-Liberals who are, generally, being nurtured in such an atmosphere where they are being taught certain things by people with certain political ideology. These students then make up their worldviews based on whatsoever is being served on the platter by these people. They hardly try to think beyond what’s being taught. Which makes them profoundly biased towards certain religion and its customs. They made to feel inferior to Westerners. And in bid to show themselves progressive, they start believing that everything which is native is dystopian, like institution of arranged marriage or other religious customs, no matter even if there’s science in it. I have had a similar experience. There is a Facebook page named ‘Humans Of Hindutva’. Irony is that what you find on this page is venomous posts mocking and abusing Hinduism, Hindus, BJP and RSS. Administrator of this page seems to be a person I talked about in above paragraph. There was a post by him/her in which he/she said Hindus are ‘jealous and insecure of Muslim men marrying Hindu women‘. And out of this jealousy Hindus have coined terms like Love Jihad. 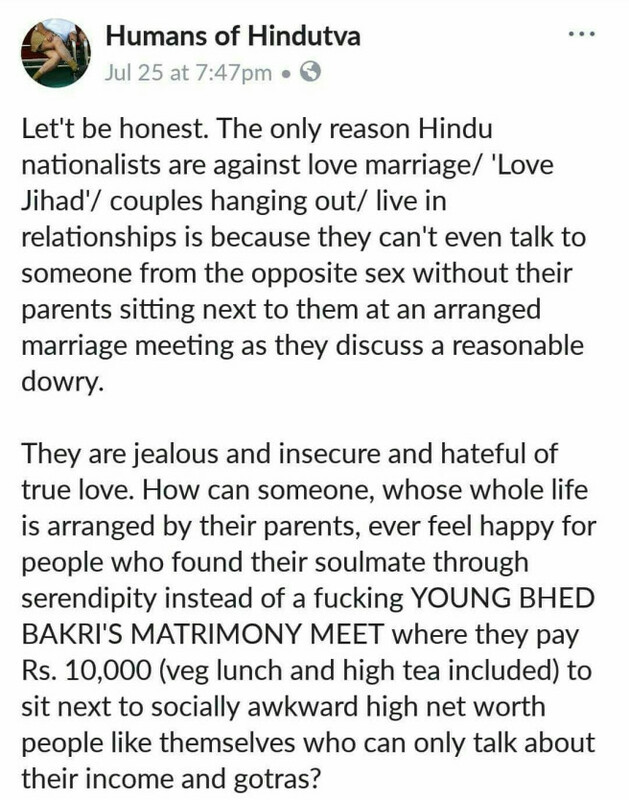 Hindus are hateful of ‘True Love’ because entire life of Hindu Males is arranged by their parents. All that he/she further conveyed is that Hindu Institution of Marriage is all about dowry and Gotras. This is said by a person who is calling Hindu males hateful, irony. I couldn’t resist my rage. I had to retort. So I made a comment. I retorted him by saying that it is better to have influence of parents in our lives because parents never wish bad for their children. I said – as I thought the person in opposition is very fond of Islam, that – it is better to live under the shadow of parents than, being dictated by a person with ambivalent character worshiped as prophet ; being remote controlled by a book which has no authentication and being ruled by a medieval draconian law which orders its followers to beat up women. I said it is not the jealousy for Muslims but fear for our girls that makes us scared of letting our girls marry a Muslim. Fear that she doesn’t have to wear Burqa, fear that she doesn’t have to share her husband with several other women, fear that she doesn’t get divorced for switching off fan while her husband was sleeping, fear that she doesn’t have to sleep with her father-in-law or brother-in-law as a part of reconciliation with her husband under Islamic laws and fear that she doesn’t have to bear a dozen children out of which half of them would die because of malnutrition. Facebook can’t tolerate bitter truth? My comments must have enraged him/her to such an extent that that person first blocked me from commenting on the said page. 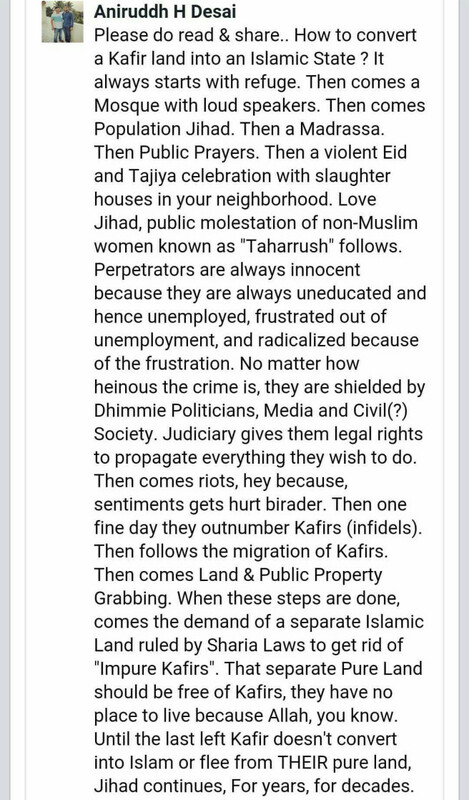 And then reported one of my old post, in which I wrote about how a Kafir or Non-Muslim land is converted into Islamic one, that led me to a one day ouster from Facebook. Now let me come back to George Orwell. This incident reminded me of George Orwell’s quote I mentioned in first paragraph. Nowadays when Militant Islam is being promulgated universally as a Religion Of Peace, terrorists who are on killing spree derives their inspiration from the same holy book apologists of Militant Islam defends, isn’t it deceitful ? When I tried to show the champion of Islam a mirror by putting truths, all he/she could do is block me from commenting. My right to tell him/her what they didn’t want to hear was snatched by Facebook which sermons about freedom of free speech. 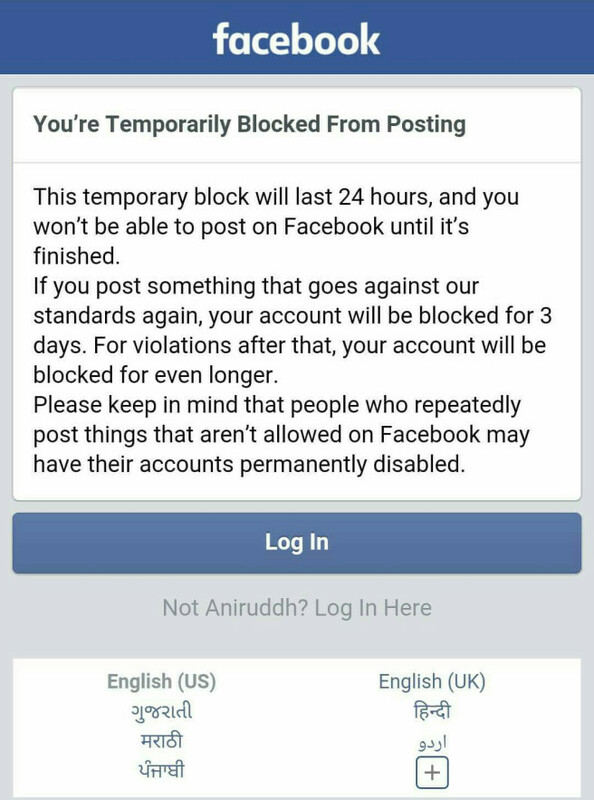 It has come into notice a long time back that Facebook is also biased towards voices who are critical of Islam, Left and self proclaimed Liberals. While this same Facebook seems to be in cohesion with people who abuse women who have opposite worldview than theirs. So, in this time when Islam, Left and Liberals are in nexus globally controlling mediums of mass manipulation like film industry or media, unveiling the Burqa of a so called Peaceful Religion, Hateful Violent and Globally Failed Ideology and double standards of a so called Liberal Society is a Revolutionary Act. If Facebook claims to be unbiased, it must ensure my fundamental right of free speech. Unfortunately it has failed me once.